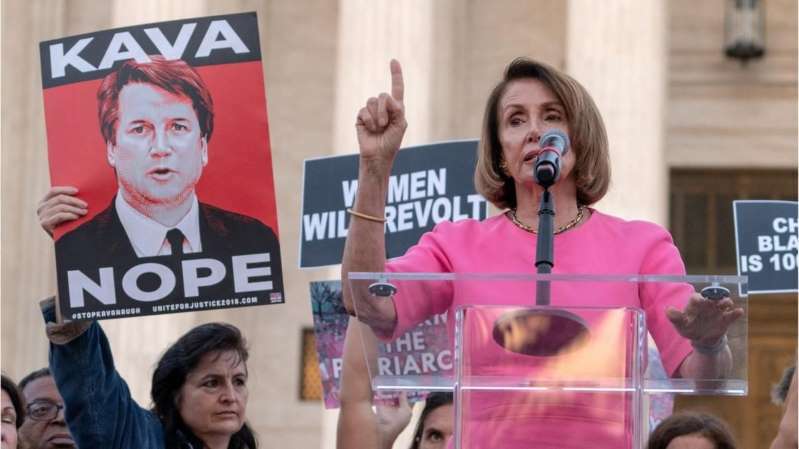 © FoxNews.com Nancy Pelosi is vowing to obtain FBI documents related to the supplemental probe into Bret Kavanaugh. House Minority Leader Nancy Pelosi, D-Calif., said Sunday she will request that the government make public the FBI's supplemental background report into sexual assault allegations against Supreme Court Justice Brett Kavanaugh, indicating the Democrats' fight against Kavanaugh is not over. In a letter to her Democratic colleagues, Pelosi said her Freedom of Information Act (FOIA) request also would cover "transcripts of interviews, instructions from the White House, and any communications to the FBI from Senate Republicans regarding the scope of the investigation," production of which she said was "important to set the record straight." The Senate narrowly confirmed Kavanaugh's appointment to the high court on Saturday, days after the FBI completed its report. In her letter, Pelosi said Kavanaugh's confirmation "has wounded the very soul of justice in our country" and called it a "dark chapter." In the end, Sen. Joe Manchin, D-W.Va., was the only Democrat to vote for Kavanaugh's confirmation. He expressed empathy for sexual assault victims, but said that after factoring in the FBI report, "I have found Judge Kavanaugh to be a qualified jurist who will follow the Constitution." Republican Lisa Murkowski of Alaska announced her opposition to Kavanaugh's confirmation but voted "present" Saturday after it became clear the judge would be confirmed. House Democrats have pledged to investigate Kavanaugh further if they win the majority in November. In her letter, Pelosi told her colleagues to channel their disappointment at Kavanaugh's confirmation toward success at the ballot box next month. "We must not agonize, we must organize," Pelosi wrote. "People must vote."